The ADAPT test system can help a spacecraft divert its course and make a smooth, pinpoint landing. The system is built on Masten's XA-0.1B "Xombie" vertical-launch, vertical-landing reusable rocket. Getting a robotic spacecraft to nail a pinpoint landing is still just a dream for engineers, but a new technology could make it easier to reach distant destinations with better precision. The new Mars landing technology, which is being co-developed by scientists at NASA's Jet Propulsion Laboratory (JPL) in Pasadena, California, and the University of Texas at Austin, compares pictures of the ground below to images already stored in the spacecraft's computer, to figure out how close to get to the landing site. Such a process would be a huge improvement over current capabilities. NASA's Mars rover Curiosity, for instance, was targeted to land in a zone that measured 4 miles by 12 miles (7 by 20 kilometers). The new precision technology would not only be useful for Mars landings, but could also be repurposed for the moon or asteroids, NASA officials said in a statement. 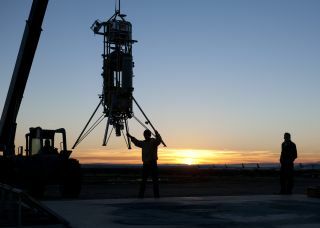 On Dec. 9, 2014, the Xombie rocket carrying the ADAPT system reached a maximum altitude of 1,066 feet (325 meters) before beginning its descent. "This represents a huge step forward in our future capabilities for safe and precise Mars landing, and demonstrates a highly effective approach for rapid, low-cost validation of new technologies for the entry, descent and landing of spacecraft," Chad Edwards, chief technologist of NASA's Mars Exploration Directorate, said in a statement. The system is called ADAPT (Autonomous Descent and Ascent Powered-flight Testbed) and was tested on the Xombie vertical-launch, vertical-landing rocket built by Masten Space Systems in Mojave, California. In a pair of Xombie test flights in December, ADAPT made it to its target altitude of 1,066 feet (325 meters). During the second test flight, Xombie made a midcourse correction at 623 feet (190 m) before successfully touching down. The ADAPT technology has numerous potential applications, including landing on the moon, asteroids and other space targets of interest. For the test flights, Xombie carried a "terrain-relative navigation" system equipped with two technologies. The first, NASA's Lander Vision System, takes and compares pictures. It is then used in concert with an algorithm, called Guidance for Fuel-Optimal Large Diverts (G-FOLD), designed for spacecraft to move to their target landing sites.